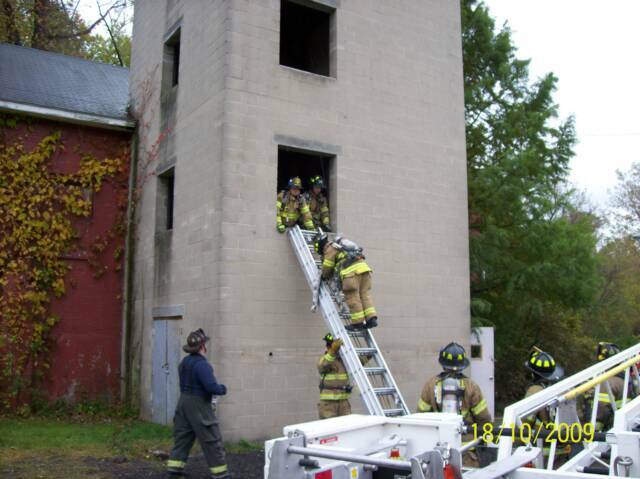 10/17/09 - WESTFALL TWP - Several State Fire Instructors spent the weekend with members of the Westfall, Matamoras, and Milford Fire Department's for a Structure Firefighter Rescue Course. 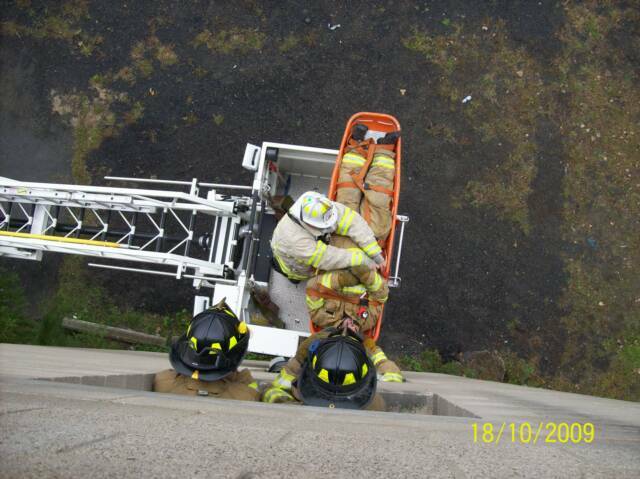 This 16 hour course based on methods of rescuing victims from buildings under fire conditions was held at the Port Jervis Fire Training Center. Thank you to Instructor Berry and his crew as well as the Port Jervis Fire Department for the use of their facility. 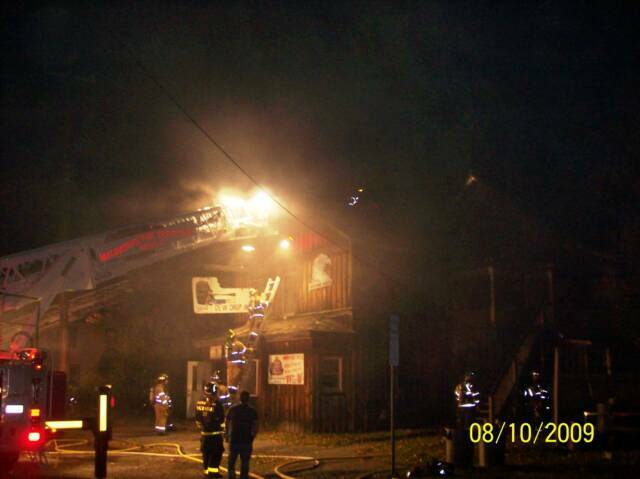 10/8/09 - MATAMORAS BORO -At 01:30 hrs, Fire Station 39 was requested under mutual aid into the borough for a working fire in a large 2 1/2 story WF structure with residential apartments on the 2nd floor and a well known local tavern below. 32 Command advised of heavy fire on the 1st floor and that (2) FIT-5 extinguishing devices had been deployed. 32 Truck, 39 Engine 1, and 39 Tanker arrived within minutes putting multiple handlines into operation making an aggresive interior attack on the fire, while Port Jervis Truck 7 and Engine 5 performed ventilation and primary searches throughout. 39 Engine 2 arrived shortly after and was put to work performing secondary searches and overhauled on the floor above. Thank you to 26 Tanker & 33 Engine who stood-by in Station 39 until our units were back in station at 23:00. 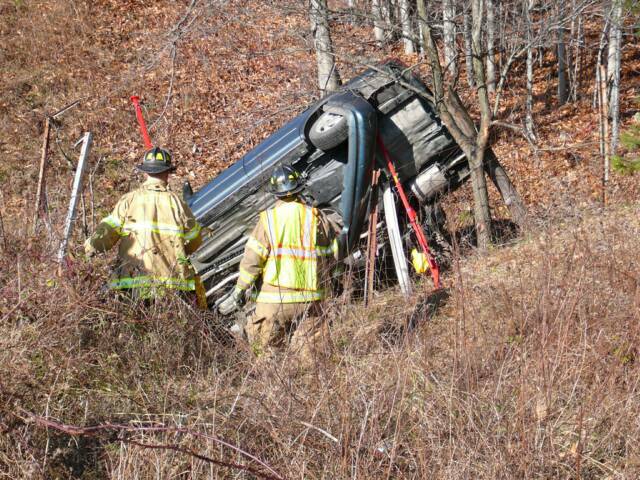 11/29/09 - WESTFALL TWP - At 10:45 hrs, Both Fire Station and Squad 39 were alerted for an Auto Accident on I-84 near MM 49. Units arrived to find a vehicle rolled over in a ravine resting against a fence and a pick-up with a tow behind RV Trailer on the shoulder. Occupants of the truck report that they were hit by the car before it veered off the road. After stablizing the vehicle a search of the car and immediate area revealed no occupants. The accident is being investigated by PA State Police. 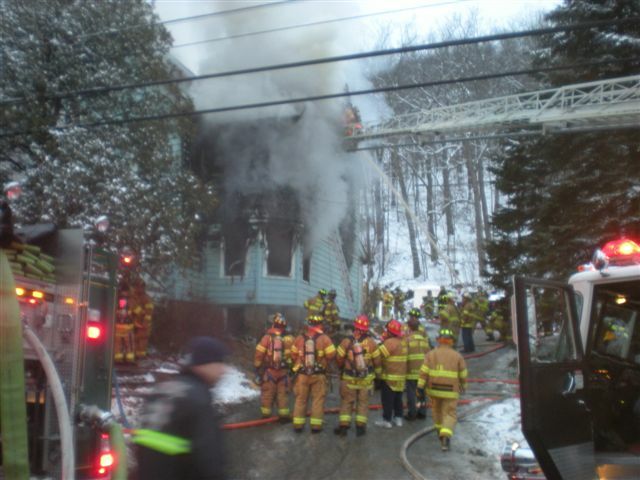 12/9/09 - DINGMAN TWP - At 13:41, 33 Command transmitted a 2nd Alarm for fire showing in 1story private dwelling. For Box 33-02, 39 Engine 1 and 39 Tanker were requested mutual aid to the scene. Units arrived to find fire throughout the vacant home undergoing renovations and crews from 33 Engine 2 advancing lines into the structure making progress on the fire. Firefighters from 39 Engine 1 assisted 33 with advancing a 2nd line and accessing the fire while 39 Tanker relayed water to 33's Engine from a nearby pond. 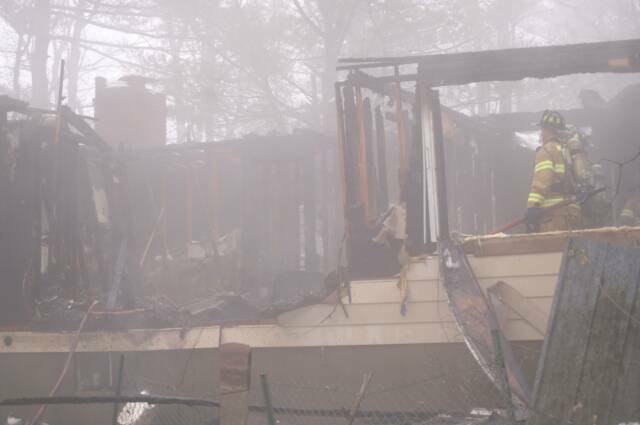 The fire was knocked down in short order followed by an extensive overhaul. Station 39 units cleared the scene at 15:31hrs. Thank you to 34 Tanker and Sandyston Engine 4 provided coverage during this incident. 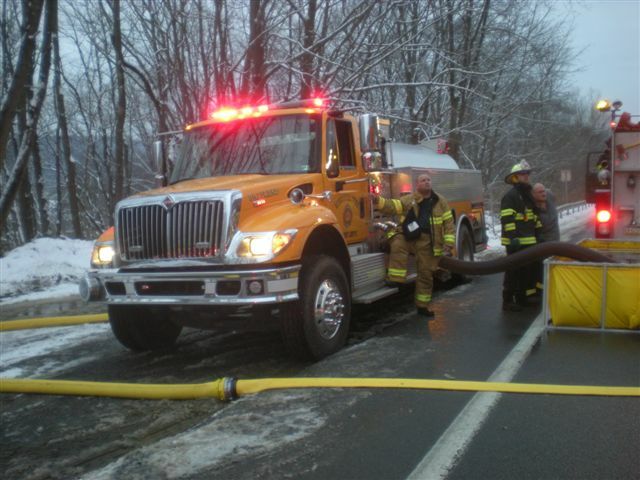 12/31/09 - SPARROWBUSH NY - At 15:50 hrs, 39 Tanker was requested to the scene of a working structure fire on Rt 42/97 near the Deerpark / City of PJ line. 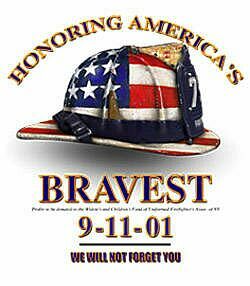 Initial reports from OC-911 indicated possible entrapment and due to the conflicting reports, both Sparrowbush and Port Jervis Fire Dept's were dispatched. Those units were met with heavy fire from a 2 1/2 story WF private house and several tankers were summoned on the 2nd Alarm. 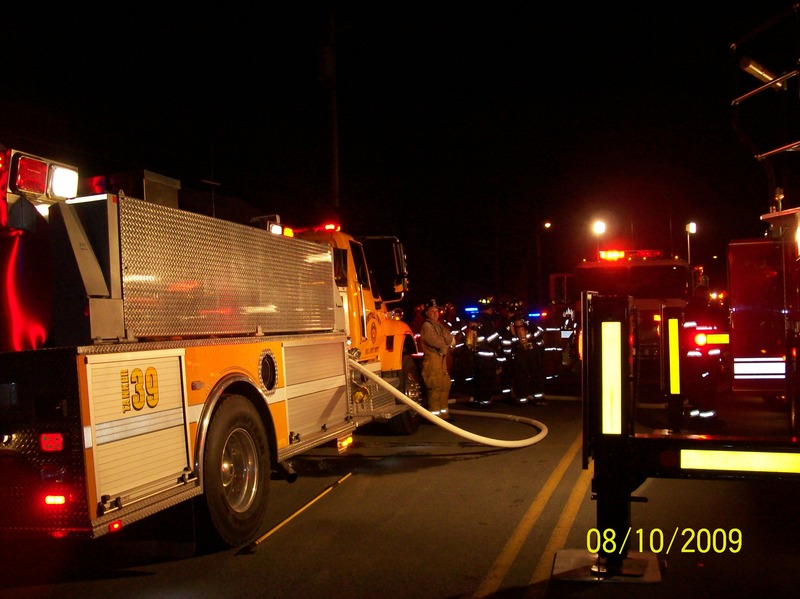 On arrival, 39 Tanker was directed to set-up a drop site for incoming tankers while drafting from its portable pond and fed Sparrowbush Engine as well as PJFD E-5 for the duration of the fire. A-398 responded to the scene for stand-by and to assist with firefighter rehab. Further into the incident, 39 Engine 1 relocated to Sparrwbush Station 1 and while on stand-by covered a minor Auto Accident at Rt 42 and Rt 97. All units returned to service at 20:56 hrs.